Batteries are the most critical elements of UPS performance. In fact, battery failure is the number one cause of UPS load loss and system downtime during a power outage or similar interruption. Preventing battery failure is key to ensuring your systems stay running. We are the experts in battery upkeep. We analyze the interaction between batteries and UPS systems to provide facilities with multiple UPS battery maintenance solutions in two important areas: battery testing and battery replacement. Don’t let a battery failure cause an outage. Let us be your battery maintenance experts. 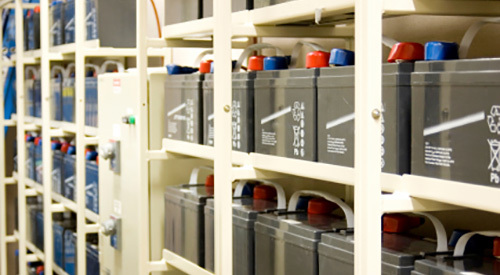 Battery Testing: In conjunction with our UPS maintenance service, our battery capacity testing services ensure the reliability, safety and integrity of your UPS system. The QPS team uses state-of-the-art Midtronics Testing Equipment and provides you with a Field Service Report to relay accurate data about battery performance. Battery Replacement: Managing UPS battery replacement projects is a complex endeavor. We understand that every manufacturer requires different battery performance and specifications, and we manage every step of the process, from selection and installation to removal and recycling. QPS is compliant with UPS battery recycling services and documents the removal process. We verify that recycling vendors are registered by the EPA, provide proper tagged disposal certifications and ensure shipping follows DOT requirements.